Memorial Day weekend in Princeton brings out many a fine ensemble. First down the pike was a formidable assemblage of bagpipers. 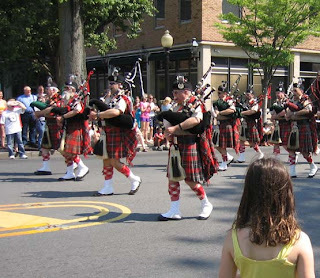 Perhaps there's a tradition of leading with the bagpipes, as it triggered memories of a movie in which the Scottish army of long ago put its bagpipers out front on the battlefield, where they got summarily gunned down by the enemy. It didn't seem like good military strategy, but it speaks to how musicians often fare in the music business. 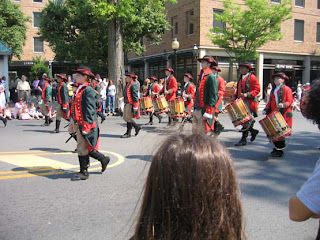 Following close on the bagpipes was a very disciplined and dignified fife and drum outfit. There were also some marching bands--one in the classic Music Man mode, the other a group from Trenton with some fine rhythmic drumming. A third band was fronted by four girls carrying wooden guns, which they shifted back and forth from one hand to the other. Unexpectedly, responding to a cue from the music, the girls launched into ballet steps, lifting the guns gracefully into the air as they leaped forwards. Ballet with guns made for a memorable image. 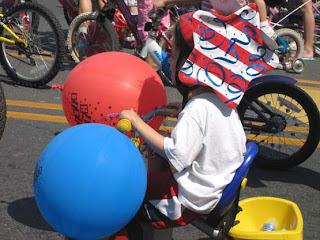 The Patriotic Bike Brigade came out in force, doing right by the nation and the planet. Then came a long line of firetrucks and emergency vehicles, followed by a tiger-bedecked calliope playing steam-powered patriotic tunes. 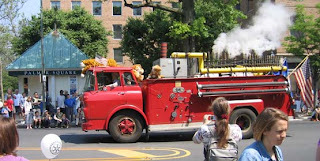 Bringing up the rear was the borough's beloved pair of parking meter patrol vehicles. Afterwards, it was down to Palmer Square for an outdoor pancake feast and jazz of the "I left my home in Indiana" variety. 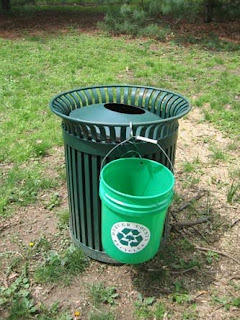 With new recycling receptacles arriving in township parks, I sent an email to the borough to ask if they could also begin recycling again in borough parks. A week later, maybe by coincidence, these buckets showed up, hooked to existing trash cans. These receptacles, wired to the trashcan to prevent them from "walking away", are a much less expensive approach than buying stand-alone recycling receptacles. Their presence doesn't mean that recycling is actually happening, though. We can hope that park users will pay attention and put recyclables in the right container, and that the staff that collect the recyclables will keep the recyclables separate from the trash. 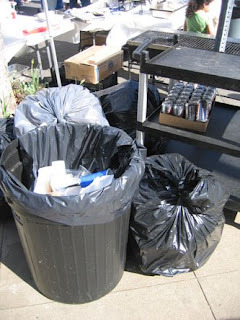 There are plenty of points in the necessary chain of events where recycling can go amiss. But at least a functional receptacle is in place. Scattered around town, hidden in full view, are these boxes of flyers with information about how to get a free ride downtown and to the Dinky. From 5:30 to 9:30am each weekday morning, and 5:30 to 9pm each weekday evening, a free shuttle plies the streets of Princeton. It runs every 25 minutes or so, up Nassau St. and down the StreetOfManyNames (Hodge/Robeson/Wiggins/Hamilton), from Library Place eastward to Harrison Street, with a spur down to the Dinky. 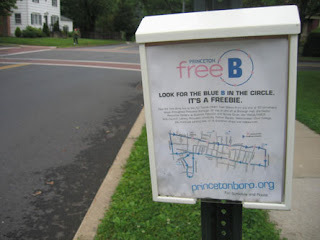 You can find specifics about its route at www.princetonboro.org. A May 1 Trenton Times article reported that in its first year of operation, it carried 4,851 riders. Funding this year will be 50% by NJ Transit, and 50% by the university. Anticipated expense from April, '08 to June '09 is $174,000. The borough is planning to expand the hours of service, to see if that increases ridership. Heading to Communiversity past a line of strange contraptions that seem to be holding their occupants prisoner. 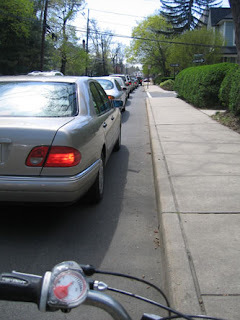 On my bike, fortunately, riding past each vehicle, I feel a wave of heat emanating from idling engines. Only 0.3% of the energy these contraptions consume actually is used to move the occupants. The rest is spent moving tons of steel and producing heat. You could say, then, that while we think of cars as transportation, their primary function--99.7%--is to hasten global warming. Somewhere far overhead, traveling through the universe to monitor progress, the unrepentant members of Planet Killers Annonymous must be watching our folly with glee. 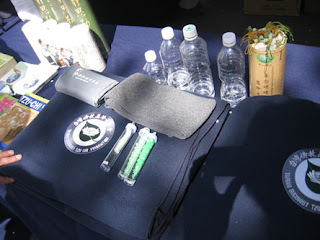 At the festival itself, a booth offered a good demonstration of how plastic bottles can be converted into blankets, which apparently were headed to people displaced by natural disasters. They said it takes 70 plastic water bottles to make a blanket. Meanwhile, continuing the tradition of dysfunctional recycling at Princeton festivals, there was a complete lack of accommodation for recycling at Communiversity. Lots of drink containers being sold by vendors, but only trash containers to receive them after their ten minutes of service to society. Princeton has a recycling ordinance, it has two recycling coordinators, it has good intentions--all to no avail. Doesn't anyone find this strange? I did, but then of course there were some positive aspects: good music, a strawberry smoothie, friends. Maybe the sustainability movement in town will bring some changes next year.